Please do not order more than the largest piece listed! Use the Contact button above to email us about reduced shipping & handling charges for multiple remnants. 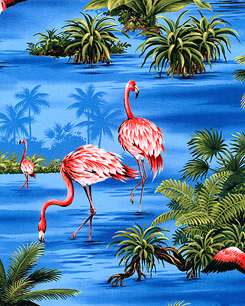 This exotic island print features beautiful pink flamingos in their tropical environment surrounded by lush greenery and a clear blue sea.Light & Hot Pink, Dark & Leaf Green, Chocolate & Bark Brown, Black, Marine Blue, Sky & Royal Blue. 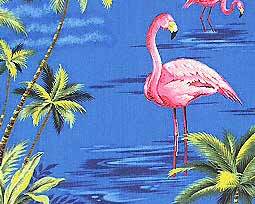 Larger flamingos are about 4 1/2 inches. 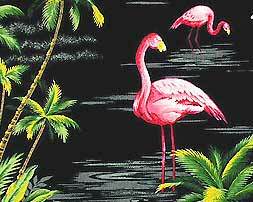 Light & Hot Pink, Dark & Leaf Green, Chocolate & Bark Brown, Black, Ivory, Vanilla Creme. 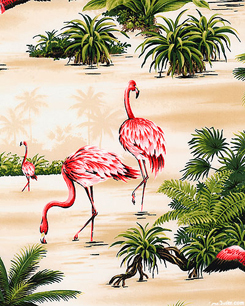 This exotic island print features pink flamingos in their tropical environment surrounded by lush greenery. 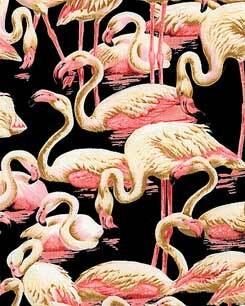 Bone, Ivory, Milk White, Cocoa, Flamingo & Candy Pink, Black, Taupe, Black A graceful flock of large scale, realistically rendered flamingos stands in a tropical pool in this exotic print. 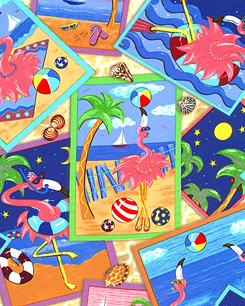 Candy Pink, Pink, Red, Sky & Cobalt Blue, Amber, Lime, Kelly Green, Black, White, Sand, Marine Blue Snapshots of an all-too-fun flamingo beach holiday collage on a sandy ground strewn with seashells in this whimsical print. 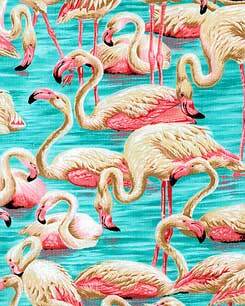 Larger flamingos are about 4"